There are fourteen men from the First World War and ten men from the Second World War on Bishopthorpe’s War Memorial. I am in the process of carrying out research into the lives of these men who made the ultimate sacrifice for their country. In due course, I hope to produce a publication as a tribute to them. Ordinary Signalman GEORGE GRANVILLE HEBDEN (known as Granville), was the son of William and Lily Hebden of School Lane, Bishopthorpe. 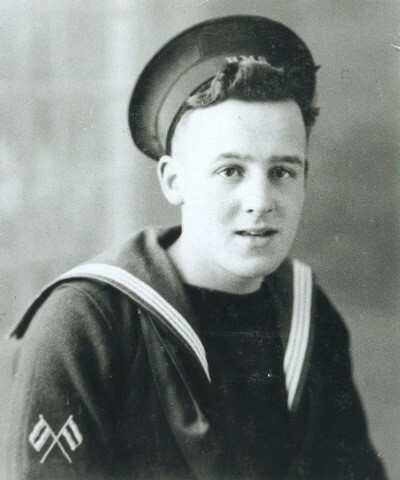 He was serving on HMS Tynedale while it was escorting a convoy off the coast of Algeria. On 12 December 1943, the ship was torpedoed by the German submarine, U-593. Granville was aged 21 when he died. His name is also recorded on the Plymouth Naval memorial. I have already found a considerable amount of official information, including the fact that one airman from the Second World War died as the result of an action for which the pilot of the plane was awarded a posthumous Victoria Cross. They both now lie side by side in the same Commonwealth War Graves Cemetery. In 1975, Mr.C.E.W.Brayley, M.B.E., published his twelfth pamphlet of ‘The Annals of Bishopthorpe’ under the title, ‘Lest We Forget’. His admirable effort detailed the short biographies of the twenty-four men on the memorial. I hope to build on Mr.Brayley’s work using the official records of the two wars which are now much more accessible. I shall also be referring to the considerable number of well-researched published works which have appeared in the intervening thirty year period. Please contact me by phone or e-mail if you have any specific knowledge or memorabilia regarding any of the men. I would be particularly interested in seeing photographs of them. Additionally, I would also be interested in hearing of any men or women from Bishopthorpe whose names are not on the War Memorial but perhaps should be.